less than 25% of normal to more than 300% of normal. 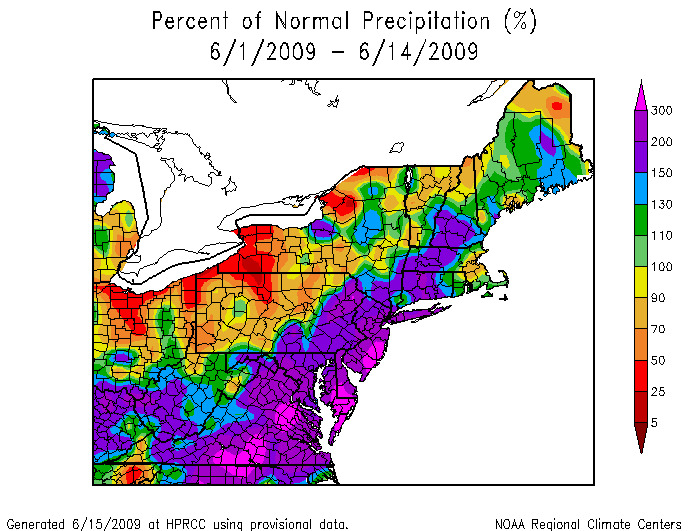 Rainfall through June 14, 2009 varied significantly from southeast to northwest. The widest range of values, 25-50% of normal to over 200% of normal, was found over the relatively short distance of about 130 miles within the state of Pennsylvania. Parts of New Jersey, Delaware, Maryland and eastern Pennsylvania received totals that were 1.5 to 3.75 inches greater than the normal for the two-week period.